This was composed from the design furnished by Mr. Lockwood Kipling, a former Principal of The School of Arts, Lahore, and father of the famous Rudyard Kipling. In the upper center of the shield are the Mayo Arms, and Quarterings, a lion rampant and an open hand. 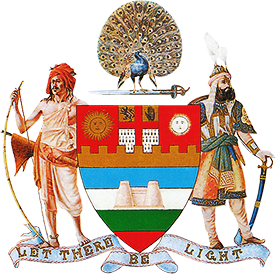 On the right and left are the Sun and Moon, typical of the “Suryawanshi” and “Chandrawanshi”, the two great families of the Rajputs.Below are the “Panch Rang”, the five sacred colours of the Rajputs: Red, Gold, Blue, White and Green, in the center of which is a Rajput fort–two towers connected by a curtain. The supports are on either sides. On the right, a “bhil” warrior with a string bow and quiver. On the left a Rajput, wearing a steel helmet with three plumes, a shield on his back, a dagger and “quatar” in his belt, and a suit of chain mail covered with embroidered cloth and gauntlet in his hand. The motto is “Let there be light“. The badge is a peacock, the sacred bird of the Rajputs, standing on a two edged, two handed Rajput sword “khanda”.